This toilet plunge adopts piston type, the flexible head can be push inwards to dredge clogged toilet. Long handle allows it reach deeper clogged place, easy to operate and clean. A practical gadget for home bathroom. Toilet Dredge Tool-It works from both suction and pushing. This solution gets a seal down in the chamber that gets a better seal than other traditional plungers and it forces the water down the pipe at a higher pressure. Long Stainless Steel Handle-The long handle is about 59cm which is perfect length for toilet cleaning use.And also allows it reach deeper clogged place and keep your hands clean. 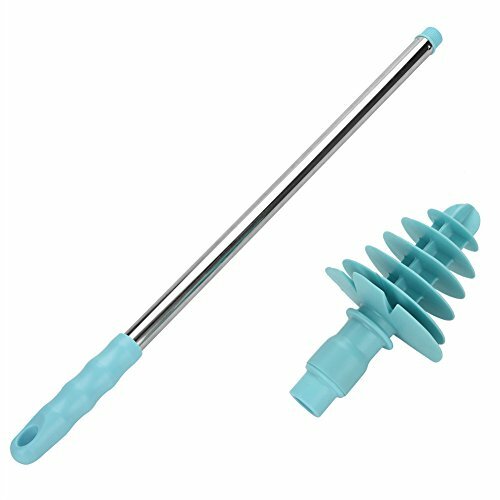 Material-Made with ABS + Stainless Steel Tube + TPR that make the tool use conveniently and easy to push back and forth from the toilet hole.Good material enable the tool use for a long time. Available for the Siphon Toilet-Repeated use.This toilet dredger designed for siphon-type toilet, toilet pipe reverse straight-type toilet, squatting-type toilet does not apply.